We’ve never made a gingerbread house in our home at Christmastime, despite the fact that doing so is very appealing to my children. Maybe that’s because we do so much else in the buildup toward Christmas that [I’m overwhelmed by the mess and the expense and the potential for disaster] it’s easy to overlook. But in this quiet time after Easter, it doesn’t seem so overwhelming. 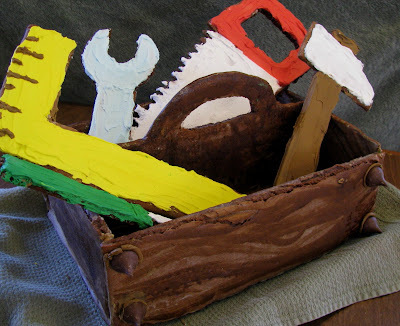 Especially when – to my little boys’ delight – the theme is not feminine swirls of icing on a pretty little house, but TOOLS! The use of a traditional Christmas recipe like gingerbread to commemorate this feast strikes me as especially appropriate, given St. Joseph’s significant role in the Christmas story. I also like having this tasty design as our centerpiece at this point in our history – given our uncertain economy right now, a reminder to pray especially for those in need of work (as well as for continued stability those who are fortunate to maintain their jobs) seems fitting. Who better a patron for these times than St. Joseph the Worker, after all? I found a website describing the general process for designing a house, using posterboard as a template. If your template can be lightly taped together and stay standing, the author suggested, it’s a good bet your gingerbread structure will hold up, too. Armed with that encouragement, I grabbed a piece of old posterboard from behind a cabinet – helpfully imprinted with ½” grid – and set to work on a simple divided box design. and one for assembly and decorating. Even if I were doing this entirely by myself, I can imagine getting pretty tired of the whole thing long before it was done, were I to go for an all-day marathon session. We started this on Monday, and finished today (Wednesday). Your temperament (and attention span) may vary. For the tools, I used a bit of clipart found in my Excel program for inspiration, and eyeballed them to scale for the box. The saw, at 5x15”, is the largest. We laid the template pieces flat out on the table, bottom edges touching, and “basted” them with a couple small strips of tape. Next, I set the handle insert in the middle, and lightly taped it to the bottom. Finally, I lifted the sides up into their box shape, taped the upper corners and secured the handle piece to the sides. I set the tool templates into the box to see if I liked the overall scale before continuing, too. Of course, you can make any structure, with any theme, so long as your basic shape holds when you tape your template together! Box-based shapes are, of course, the easiest to work with. This recipe (which follows) makes 9 cups of dough, which is enough for two and a half 12x16” slabs of unbaked dough, ¼” thick (just enough to make the tool box and tools proportioned as I have here). For planning purposes, you may be interested to know that it uses most of a 12 oz jar of molasses, at least a pound of brown sugar, nearly half of a 5 lb bag of flour, and 3/4 of a pint of heavy cream. With this recipe, you par-bake the dough for 30 minutes at 275 degrees F, then remove it from the oven to trace out and separate the pieces with a sharp knife (a pizza cutter is handy for the long, straight box lines). The dough is then baked for an additional 75 minutes (total baking time: 1 hr, 45 minutes). Line 12x15” rimless baking sheets with parchment, and preheat oven to 275 degrees F.
Whip cream and vanilla together until soft peaks form; set aside. In a separate bowl, mix brown sugar, baking soda, ginger & cinnamon. Add to the whipped cream, along with molasses, until well-combined. Of course, I had helpers. I then rolled out the dough directly on the parchment-lined pan, after first giving the parchment a good sprinkling of flour. Place a little less than half of the dough on the parchment and flatten slightly; sprinkle with a little flour and cover with a sheet of plastic wrap to make it easier for the kids to succeed in rolling (I love doing this for myself, too). Because most of my pieces were rectangles, I added dough as necessary to fill the pan as we rolled, and squared up the slab edges with a pizza cutter before baking. I also used two ¼” dowels and an extra-long rolling pin to help maintain an even thickness. Bake as described above – don’t forget to cut out the individual pieces using your template and a sharp knife after 30 minutes of baking! After cutting, the pieces should be loosened and separated, and extra dough removed (for grateful snacking by same crew) before returning to the oven for additional 75 minutes of baking. Let the cookies rest on the baking sheet for about 10 minutes before removing them to a wire rack to finish cooling. The resulting shapes will be very solid and hard, and fairly easy for the novice to work with. (Thinner pieces would probably look nicer, but in the end, the thicker ones were, I think, pretty forgiving.) All three of my children found the cookies to be irresistible, and the house smelled like Christmas! The original recipe has alternate temperatures and baking times for slabs of varying thicknesses, as well as many baking and decorating tips. Good news on the construction front: Icing covereth a multitude of sins. Despite my best efforts to keep my pieces square, the resulting baked pieces weren’t. In the end, it really didn’t matter, though: Thickly-applied Royal Icing makes a superb “construction cement” and dries rock-hard. I was even able to successfully repair our Carpenter's Square cookie, which my excited 3 yo dropped on the table. The only real construction challenge in my particular design was getting the center piece, which turned out to be slightly too long, to fit: I chiseled a 1/2” wide channel in one end piece, and shaved the edge of the handle piece as well, using a serrated steak knife and the bottom handle of a metal toddler spoon, until I was satisfied with the fit. 1 pound (4 cups) confectioner’s sugar. I am a stickler for not letting my kids eat raw eggs. The risk probably isn't that great, but I don't like to worry about such things, and using the powder eliminates that concern. I used brown food coloring gel to tint a small amount (less than a cup) of the icing. The resulting shade was more or less the color of peanut butter, but I thought it looked better than stark white, since we weren’t going for a winter scene here. To assemble the tool box, I loaded about ½ cup at a time into a quart-size plastic bag, then snipped off one corner. I squeezed a thick bead of caulk --er, frosting along the edge about to be cemented, and after setting the piece, ran a finger along the bead to smooth out the joint. I attached the two long side pieces to the bottom piece first, and was impressed with how little support was needed to keep the pieces square – though I did set a thick book next to each side, just in case. I also gave these first two pieces about 15 minutes to set before adding next one short side, then the middle handle piece. The chiseling of the final side was the only adjusting needed, and the sturdy piece was then left to dry, unsupported, overnight. After that, the only thing left to do is …. There are no rules here, of course – you go to town with whatever appeals to you and your kids! We glazed the entire box and let it dry; then I tinted more glaze with a whole lot of brown gel (as dark as I could get it) and painted lightly over the white glaze with a couple different kinds of brushes (sterilized 1/2” easel brush and a silicone pastry brush, mostly). I had planned to let the kids decorate to their hearts’ content using leftover Easter candies; however, you can’t do much with marshmallow peeps. :) Anyway, once the "wood grain" dried, it looked so nice I thought adding more would be overkill. So, instead, we just opened up 8 Hershey Kisses, and used brown-tinted frosting to "glue" them on the long faces of the box as if they were screws. Ta-daah! 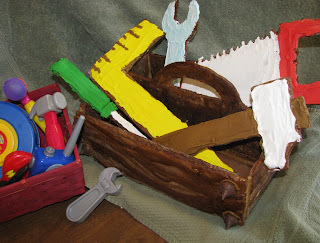 The rest of the Royal Icing was tinted in cheerful shades of red, yellow, green and a very pale blue, with some left white; this was used to paint the tool set. Last year on one of Joseph’s feast days, I created this dessert for the first time. If I remember correctly, it came from the Food Network – a Giada De Laurentiis recipe originally. But I modified it a bit and the recipe below is what I’ve settled with. It’s a modified cream puff of sorts – a traditional St. Joseph dish. It also requires a little bit of construction, which is most appropriate for this saint. Ultimately though, it’s simple (with the help of a boxed cake mix) and delicious, but looks very special served on your best china for this great saint’s celebration. Line 24 muffin cups with muffin papers. melted butter, and vanilla extract in a large bowl for 2 minutes. (I find it easiest to do this with an ice cream scoop). about 15 minutes, until toothpick comes out clean. in a large bowl until firm peaks form. Fold the raspberries into the whipped cream. Remove the muffin papers from the cupcakes and cut each cupcake in half. Spoon the raspberry whipped cream onto the cupcake bottoms. Place the cupcake tops on the cupcakes. Dust with more powdered sugar and serve with a squirt of whipped cream, if desired. St. George's feast day is April 23rd. St. George is the patron saint of England (and tomorrow marks its National Day) but also of other regions and countries such as Aragon, Catalonia and Valencia; Portugal, Cyprus, Georgia, Serbia, Bulgaria, Bosnia and Herzegovina, the Republic of Macedonia. Wikipedia shares the vast popularity of this saint. There are already some great ideas for St. George from last year, one post marking my one year anniversary writing for Catholic Cuisine (thank you, Jessica). William Shakespeare's birthday is also celebrated on this day, April 23. His famous and often quoted 'Battle of Agincourt' speech includes the rally call by Henry V: Follow your spirit; and, upon this charge, Cry 'God for Harry, England and St George!'" (Henry V, Act Three, Scene 1). How To...Celebrate St George's Day. This is a wonderful .pdf file with information, recipes, and crafts. Although in the back of my mind I knew St. George's feast day was tomorrow, I hadn't really put together some firm ideas for my son and I to celebrate. We have lots of other busy plans, but we definitely need to fit in one of his favorite soldier saints. I know once we start talking and reading about St. George, some Playmobil knights are going to action! This Sunday, one week after Easter, we celebrate Divine Mercy Sunday. The Divine Mercy image is one that is full of powerful symbolism of Our Lord's great mercy. 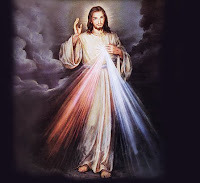 Jesus appeared to Saint Faustina with rays of red and pale light streaming from the area around His heart. His right hand was raised in blessing, recalling the scene of Easter Sunday night (see Jn 20: 19-23). He asked Blessed Faustina to have this vision painted signed with the words, Jesus, I trust in You! I am offering people a vessel with which they are to keep coming for graces to the fountain of mercy. 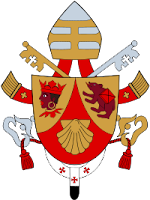 That vessel is this image with the signature: "Jesus, I trust in you. (Diary, 327). O Blood and Water, which gushed forth from the Heart of Jesus as a fount of mercy for us, I trust in You (Diary, 84). The image could be used to recall His mercy for us in the feast day meal celebrations. I had a couple different ideas I wanted to share. One idea is to incorporate the colors, so symbolic in the image, into a Divine Sunday meal - red and white. Jessica shares her menu from last year - pasta with red sauce, white grape/cranberry juice, and rolls, with Strawberry Shortcake for dessert! A perfectly colorful feast. My twist on the strawberry shortcake idea is to arrange it like divergent rays as seen on the image. I also thought the image would make a great decorated cake for dessert. Because the rays are so promiment and meaningful in the image, there are some ideas for making them stand out. My original idea was to make a full sized sheet cake and layer a printed image of the Divine Mercy on it. It could be done with regular paper and removed for cutting and eating (like Anne did for her creative scapular cake) or if you have the availablity of a bakery that will produce an edible image from a picture (or time to order one) go that route. After the image is on the cake I would add rays of colored frosting radiating from the heart in the image - either piped on or spread flat. You could use red and white or red and pale blue since that is how it appears in many images. That pale water color could go either way. After seeing Jessica's festive Pope Cakes Thursday, I thought of another cake modification which probably is much easier to pull off - and that is Divine Mercy cupcakes with printed images inserted in the back of the cupcake. Then pipe or spread frosting in desired ray colors from the paper image forward. And remember, these treat ideas (shortcake, cupcakes) could also be used for an afternoon tea any day of the week following the recitation of the Divine Mercy Chaplet at the hour of Divine Mercy. Well, the other day, I ran across these directions online, for this fairly simple Lamb shaped cake, which doesn't require a mold! Isn't it cute?!? 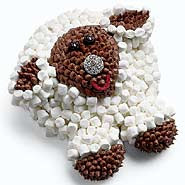 It reminds me of the Lamb Cupcakes we've made a few times. 1. For the basic shape, set a dome cake upside down in the center of a round cake and secure with icing. 2. Cut one cupcake in half and place it for the ears, then arrange two more cupcakes as legs. 3. Frost the cakes (except for a triangular face area), the outsides of the ears, and the top halves of the hooves with the white icing, then cover with mini marshmallows. 4. Use a pastry bag (or a plastic bag with one corner cut off) to pipe small dollops of chocolate icing onto the face, bottom halves of the hooves, and centers of the ears. Decorate as shown. ETA 2013: See my updates for Paska and Pascha. My favorite area is through festive breads (although I confess I haven't been as adventurous since my son was diagnosed with food allergies). My interest in Ukrainian psyanky (and Polish pisanki) made me interested also in the Ukrainian and Polish foods used to celebrate Easter. 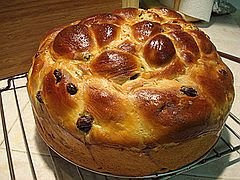 One year I made this very simple Paska, Ukrainian Easter Bread from The Festive Bread Book by Kathy Cutler (1982). It's festive, but not heavy, and a perfect accompaniment to the sweet Easter cheese mold. This is usually included in the Easter Baskets brought to church for a blessing (also the Roman Ritual). I simply used a Corning Ware 1-1/2 quart round covered French White Casserole without the lid and it worked out fine (use what you have!). Beat egg and egg yolk until fluffy and light. Add 2 cups flour, sugar, salt yeast, lemon peel, orange peel, vanilla and raisins. Mix thoroughly. Heat milk and butter to hot (120 to 130 degrees F). Add to flour mixture. Mix thoroughly. Add enough remaining flour to form a soft dough. Knead on lightly floured surface until smooth -- about 10 minutes. Place in greased bowl, turning to coat top. Cover; let rise in warm place until double -- about 1 hour. Punch down dough. Set aside a little of the dough to be used as decoration on top for the loaf. Shape the rest into a ball. Place in greased cake pan 3 inches deep and 6 inches across or 1 quart souffle dish. Make cross of remaining piece of dough; place on top of loaf. Cover; let rise in warm place until double -- about 30 minutes. Bake in a preheated 350 degree oven 45-60 minutes or until done. Cool on wire rack. While still warm, brush with melted butter if desired. We enjoyed spreading the Easter Cheese Mold on the bread. At first I was a bit confused, as the name for the dessert cheese is Pascha (or Pashka), very close to the Ukrainian name for the bread. And "Pascha" is the Orthodox name for Easter. Once I got the names sorted out, I was convinced I had to try the cheese. I didn't have an "official" mold, so used the clean clay unglazed flowerpot as per A Continual Feast's directions. Be sure to make ahead (today or tomorrow). I omitted the candied fruit. My cheese did not mold (it didn't drain), so I ended up serving from the flowerpot. It was still delicious. This is an absolutely beautiful and delicious dish; versions are prepared in Poland, Russia, the Ukraine, and Latvia. It is made in a tall mold (or flower pot), then turned out onto a large platter and decorated. Cool and rich, it tastes like a cross between ice cream and cheesecake. 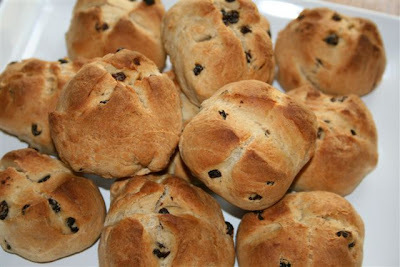 It goes wonderfully with the sweet Easter breads, such as Kulich, or with the various Easter cakes. In a mixing bowl, combine the cheese, butter, the other 1/2 cup of cream and the vanilla. Cream until the mixture is smooth. Add the egg mixture, then the fruits, almonds, and orange or lemon rind. Blend thoroughly. Line a flower pot or Pascha mold with 2 thicknesses of cheesecloth. Place the pot over a bowl (to catch liquid), and pour the Pascha mixture into the pot. Put a layer or two of cheesecloth over the top, set a plate on it and something heavy on the plate. (The purpose is to press the extra liquid out of the Pascha and into the bowl below.) Chill overnight or for a day or two. The best part after making these goodies, was arranging the Easter basket for a blessing at our parish by the pastor. I included our Easter eggs, pysanky, ham, wine, butter lamb, paska and pashka. I loved seeing all elaborate cloths and baskets and beautiful breads and goodies, and it inspired me to do more the next year. "Judasas" are served with honey at breakfast in Czechoslovakia. These are breakfast cakes of twisted dough, made to look like rope, suggesting the fate of Judas the Betrayer, who "went and hanged himself" in remorse after he had identified Jesus to His enemies. Honey is considered a preventive against disaster (Easter the World Over by Priscilla Sawyer Lord and Daniel J. Foley, 1971, p. 58). I had mentioned that I couldn't find a recipe, nor did I know the Czechoslovakian name. A reader, Michelle, was up for a challenge and found a recipe (and also thanks to P.J. for sending another one). After I found that they are called "Jidáše" (pronounced yi-dah-shay), I was able to find one other one. I've adapted the recipes below, fleshing out instructions and posting it here. I have to give warning that the recipe is "untested" and the conversions into American measurements in parentheses are my suggestions and not exact. I've shared a few photos to illustrate there are various interpretations on how to shape the "rope", so there's not one "correct" way to form the bread, so have fun! And although the Czechoslovakian tradition is to serve them on Holy Thursday, in remembrance of Judas hanging himself, I think I would serve them the day before, today, on Spy Wednesday. It is known as Spy Wednesday because this is the day in the liturgy that Judas met with the high priests and made the bargain for his betrayal for 30 pieces of silver (Matt 26:14-16; Mark 14:10-11; Luke 22:1-6). Prepare the leavening mixture using the milk, yeast and sugar. In a separate bowl, blend the butter, egg yolks and 80 grams of honey. Mix in the flour with the leavening mixture, then add the butter and egg mixture. Add grated lemon zest and salt. Leave the dough to rise for one hour. Then, cut strips and shape them into spirals (this shape is to remind us of the rope with which Judas hung himself). Arrange the rolls on a baking sheet covered with parchment paper and let rise. Preheat oven to 375°F, brush the jidáše with the egg wash. Bake for about 15-20 minutes at 375°F or until golden brown. While still hot, glaze with honey. Bring a little springtime into your kitchen. With Easter quickly approaching we have just about the perfect amount of time (7-10 days) to grow a living basket of Easter grass. Wheat berries (or rye berries) from the pantry are used for this project. Plant them and in about a week you’ll have a lovely and living basket. It makes a beautiful center piece with a few colored eggs inside. Don’t forget the health benefits of wheatgrass – which could be juiced or blended into a smoothie after the celebration. Wheatgrass berries are famous for their medicinal and nutritional benefits. They are an excellent source of calcium, iron, magnesium, phosphorus, potassium, sodium, sulphur, cobalt and zinc. If you don’t normally keep wheat berries on hand, you can purchase them at most health food stores. To prepare your basket(s), first, rinse the seeds. Then soak them in water for 6-12 hours (until slightly sprouted – just opening). Choose a container (basket, tray, flower pot). If you choose a basket cut a piece of cellophane or plastic wrap large enough to line the plus stick out over the top edge by about one inch (this will keep it from getting soil or water all over). After the wheat grass seeds have sprouted, line the bottom of your growing container/basket with approx. 2 inches of potting soil (or vermiculite mixed with soil). Drain and rinse seeds and spread them over the soil in a single layer, with seeds close but not overlapping. Cover with a very light layer of soil. Lightly water the seeds with a spray bottle. Place basket or container in a warm area but not in direct sunlight. Cover it with newspaper or paper towel. Each day mist the seeds with water. Do not use too much water – just keep moist. Remove the newspaper once the leaves start to sprout (usually a couple of days). Watch them grow. In about a week you’ll have several inches of lovely green Easter grass. In researching I found several cutlures where setting out seeds to sprout before Easter was a common tradition. Italy, Greece, Finland are mentioned. The symbol of a seed bringing forth new life and the image it calls to mind of the death and resurrection make this a timely project for the Easter season. There are some weeks during the year, liturgically speaking, that allow us to link our offerings in the kitchen to the Church year more than others - Holy Week is one of those weeks. "...the cooking which we do will add special significance to the Church Year and Christ will sanctify our daily bread. That is what is meant by the liturgical year in the kitchen." There are so many recipes here - ideas for those lovely teas, Resurrection Rolls - and so many others in the archives...and yet to be posted. How does one organize and shop for all these ideas to live the liturgy through our humble offerings in the kitchen? I'd like to offer a weekly menu planning sheet for you to use as you plan your offerings next week. Click on the image, and then print the menu. Fill in your plans as you go, add in a teatime next week, your meals, the significant focus of each day. Use the menu to shop from as you go to market. I know on a week like Holy Week I like to have a good plan going in so that I too can observe a little silence rather than rushing around wondering if I have everything I need for Hot Cross Buns. 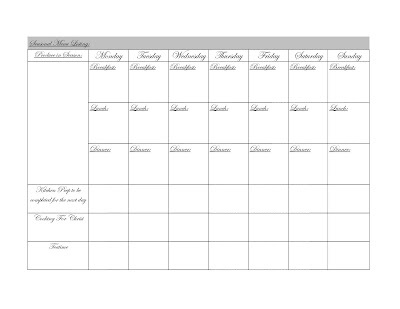 I use this menu sheet year round to help me plan because it helps me link seasonal offerings at the market with meals, teas, and menu plans that link the liturgical year with my family table. Figs are associated with Palm Sunday - possibly because of the traditionally held belief that Christ ate figs after His entry into Jerusalem. There is also the account of the withering fig tree right after Our Lord's entry. **A plate of fresh figs and cheese would be lovely on Palm Sunday. **Your Maundy Thursday meal as you are likely to return home late after the liturgy that evening. **Get a head start on Easter baking. 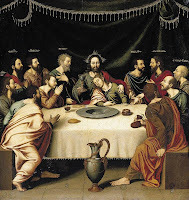 "In all German-speaking countries people call Maundy Thursday by this name (Grundonnerstag)...Scholars explain its origin from the old German word grunen or greinen (to mourn), which was later corrupted into grun (green)." **In light of the green connection, albeit a strange one, why not consider a Spinach pie? (recipe below). It is easy to use a paring knife to etch a symbol into the top of a Spinach pie...consider a simple crown of thorns, a Cross, a nail. **How about shaping your bread dough into a rope to signify the ropes Our Lord was bound by during the scourging? Without a doubt, the Church leads the faithful on a journey throughout Lent building us to this point - Good Friday. Pius Parsch calls this "Christendom's great day of mourning" and that is exactly what it is. On this one day of the year, out of reverence for the day that Our Lord sacrificed Himself for us, Holy Mother Church restrains from offering the unbloody sacrifice of the Mass. The altar is stripped, sanctuary lamp is dark, lights are out. Our Lord is on the Cross. He thirsts. We mourn. This one statement by Our Lord, "I thirst", motivates my entire meal plan for the day - it should leave us thirsting. I don't mean that I withhold liquids from my family, but I do mean that the meal offerings are stripped of every extra, every shred of decadence. According to Florence Berger in Cooking for Christ, "Pope Gregory (I) directed that only bread, salt, and vegetables be eaten on Good Friday." For a few years now, we've tried this. **Consider a hearty, whole-grain bread to sustain everyone on this day. **How about a vegetable tray for lunch? **Try roasting or baking some vegetables as a dinner with the whole grain bread - roasted sweet potatoes, baked potatoes (minus all the toppings) with chives and salt, cucumber salad tossed with vinegar. **Consider incorporating vinegar into an offering this day as a remembrance that vinegar was offered to Our Lord on the Cross. **Consider water only as a drink for the day remembering that from the Cross Jesus thirsted. Traditionally, the pretzel was only eaten during Lent. It is available all year round now, but before it became a popular snack food it was available from Ash Wednesday to Good Friday. 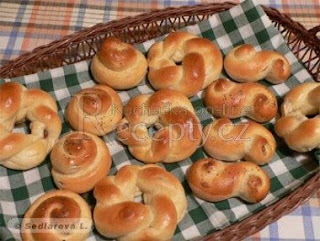 There are records of Lenten pretzels in a 5th century manuscript in the Vatican Library. Early Christians ate no dairy products during Lent, so pretzels were made from the simplest of ingredients - flour, salt, and water. It is made in the shape of two arms crossed in prayer. The origin of the name comes from the word "bracellae" (little arms). In German it became "Bretzel" which then changed to "Pretzel". 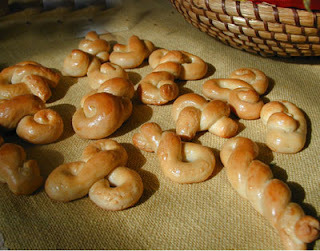 If you haven't yet made pretzels during Lent, why not try it during Holy Week? Add the honey to the water; sprinkle in the yeast and stir until dissolved. Add 1 teaspoon salt. Blend in flour, and knead the dough until smooth. Cut the dough into pieces. Roll them into ropes and twist into pretzel shapes. Place pretzels on lightly greased cookie sheet. Brush them with beaten egg. Sprinkle with coarse salt. Bake at 425 for 12 - 15 minutes - or until the pretzels are golden brown. Last year I shared a recipe for Resurrection Cookies that I make with my children each year on Holy Saturday. 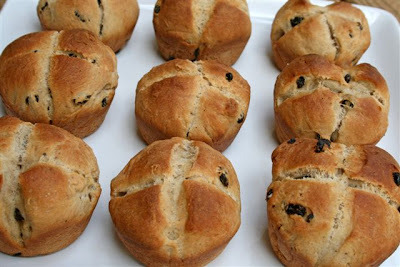 This year I thought I would share another great recipe, which is also full of symbolism, and is a great hands-on way to tell the story of Christ's Resurrection to children. Update: I posted pictures of my children making these rolls here. Our family has a tradition of eating monkey bread, sweet, gooey and delicious, on Easter morning. Usually I make it in a bundt cake pan, but this year I wanted to try making it in a cross shaped pan to honor Jesus' sacrifice for us on the cross. I bought the cross cake pan for $5 on ebay. It took me a couple trial runs to figure out how to change the recipe for the different cake pan, but no one in my family minded eating monkey bread twice this past week. Preheat oven to 350 degrees. Cut each biscuit into four quarters. Mix all dry ingredients above in a bowl. Spray surface of cross cake pan with nonstick cooking spray. Dip each individual biscuit quarter into the cinnamon sugar mixture and then into the cake pan. Pour half of remaining sugar mixture evenly over biscuits. Melt margarine in microwave and pour all of it evenly over biscuits. Then pour remaining sugar mixture over biscuits especially in pools of melted butter. Place cake pan on foil covered cookie sheet because it will spill over and be messy. Bake for 35-40 minutes depending on your oven. We like our monkey bread a little undercooked so we cooked it in that range. If you like it really cooked or even a little crispy, then maybe cook between 40-45 minutes. Immediately after taking out of the oven, carefully flip cake pan onto platter and let stand until cool enough to eat. If you want to make it in the traditional circle bundt cake pan, follow the same recipe as above but only cook it for 30 minutes and you don't need the cookie sheet under the cake pan. One idea for being creative with the circle monkey bread would be to put toothpicks in it and have it resemble a crown of thorns. This would be more appropriate earlier in Holy Week. Another idea on Easter Sunday would be to put a white candle in the center symbolizing Christ being the light of the world.